This article explores ways in which a cosmopolitan, urbane subject is on display in Macao’s gaming, tourism and leisure industries. Much like the fin-de-siècle flâneur studied by Walter Benjamin, the cosmopolitan tourist and gambler portrayed in the visual culture of Macao witness the city as both an aesthetic object and as a set of new experiences to be seen and felt. In asking for whom and to what end this subject and the urban imaginary of Macao is created, it is necessary to examine how a cosmopolitan space and subject have historically been represented. This article borrows from Aby Warburg’s Mnemosyne Atlas and Thom Anderson’s video essay, Los Angeles Plays Itself the use of a comparative approach to scenes and images. While Warburg’s early 20th century approach to art history and Anderson’s later film criticism arose from different eras and disciplines, they both point to the value of juxtaposing images as a form of analysis. The contention in this case is that through the comparison of specific details in movies set in Macao one might construct a visually mediated genealogy of the cosmopolitan. In other words, to better understand the urban imaginary of contemporary Macao it is helpful to look back at cinematic images of leisure and nightlife from the past. To this end, the tuxedo, as well as other luxury goods, so often seen in films about Macao can be explored as a visual through-line linking tropes of success and leisure to the construction of a new vision of cosmopolitanism that is marketed to predominately Chinese tourists. Image 1. Taxi in front of Galaxy Macau, Macao. Copyright 2014 Author’s own. Macao is a place built around arrivals and departures with the average visit lasting little more than 24 hours. Thousands of tourists come across the border daily to enjoy the legal gambling that is available in this special administrative region of China. Macao, a city with roughly 650,000 permanent residents was visited in 2016 alone by 30 million visitors. The vast majority of these visitors come from mainland China, but the numbers include visitors from Hong Kong, South Korea, and other parts of Asia. Gaming was a large part of the economy of Macao well before its return to China during the 1999 handover from Portugal and remains so today. Its special administrative status makes it an ideal testbed for the mainland Chinese government to experiment with introducing and regulating the availability of legal gaming for its citizens with the flow of tourists effectively managed by changes to visa schemes (Simpson 2011). Nonetheless, central government officials have routinely encouraged Macao to diversify its economy to provide alternative attractions for tourism and leisure. So while the predominate industry remains gaming there is an active effort to rebrand Macao as a site for other forms of leisure. Leading up to the handover, the Chinese and Portuguese governments worked together to define and promote a continuous image and history of multicultural cohabitation in Macao (Clayton 2010). Every year, since 2011 the date of the handover, December 20th, has been celebrated through a campaign called “Parade through Macao, Latin City.” In addition to marking the anniversary of the handover, the campaign promotes a vision of multicultural harmony. With costumed dancers, musicians, and elaborate pageantry Macao’s Portuguese heritage is linked with a broader notion of Latin culture. The city itself becomes an example of a multicultural ideal meant to be seen both by local residents and through its television broadcast seen by the millions of potential tourists that may one day come to experience it in person. This is just one example of the active effort to brand Macao as a safe controlled cosmopolitan experience of different cultures. Outside of the typical heritage tourist sites and such occasional festivals celebrating cultural heritage and diversity, the casino industry that drives most of the economy also offers its own vision of cosmopolitanism. In one continuous air-conditioned space, tourists can walk from the Venetian to the Parisian or cross the street to a wide variety of large scale casino resort complexes. With names like Studio City, City of Dreams, and the Galaxy they suggest their ambition to offer a whole world of leisure and gaming services. For the potential tourist, the suggestion is that it is possible to take in the world in just one destination. A whole host of cultural criticism has rightly been levied at the notion of a singular universal vision of cosmopolitanism. James Clifford’s notion of discrepant cosmopolitanism highlights the wide variety of mobility around the globe in contrast to traditional narrative tropes of discovery that inform European colonial literature (Clifford 1997). In Flexible Citizenship: The Cultural Logics of Transnationality Aihwa Ong studies a Hong Kong Chinese diaspora that has expanded beyond a traditional notion of a bounded national culture (Ong 1999). Given the new mobilities of transnationality and the wide variety of economic and cultural imperatives to move, ranging across a spectrum from tourists to refugees, is it still viable to describe oneself, as the Greek philosopher Diogenes did, as a “citizen of the world?” To answer this we need to ask alongside Ulf Hannerz, “[a]re tourists, exiles, and expatriates cosmopolitans and when not, why not?” (Hannerz 1990, 241). He answers himself in theorizing that cosmopolitanism “is an intellectual and aesthetic stance of openness toward divergent cultural experiences a search for contrasts rather than uniformity” (1990, 239). Studying the image of cosmopolitanism on display in Macao does not have to involve questioning the authenticity of the resorts and cultural experiences on offer. The more relevant question is what kind of experiences and differences tourists can encounter and how they might be construed as part of a cosmopolitan experience. 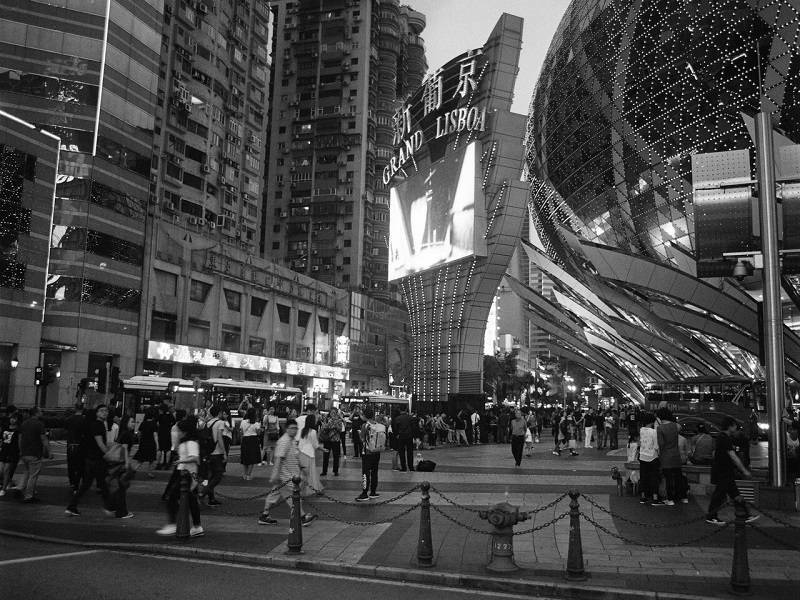 Tim Simpson has theorized that Macao offers an “interiorized and encapsulated urbanity” (Simpson 2014, 824). Given that Macao’s casino resorts promote themselves as cities in miniature, we can ask what kind of encapsulated cosmopolitan do they deliver. Do the amenities, services, and experiences they provide to tourists looking to temporarily participate in new cultures and cities result in a new form of cosmopolitanism? As with other cities designed around tourism, Macao is a place first seen ahead of time. It is seen in official promotional materials as well as in vlogs, travelogues, and other such material shared online. In a media landscape dominated by the gaming industry, a particular vision of cosmopolitanism is on display. Images of nightlife, leisure, and luxury are regularly depicted. These also often take the form of a cosmopolitan male subject decked out in black tie who is there to witness the city as a set of new aesthetic experiences. 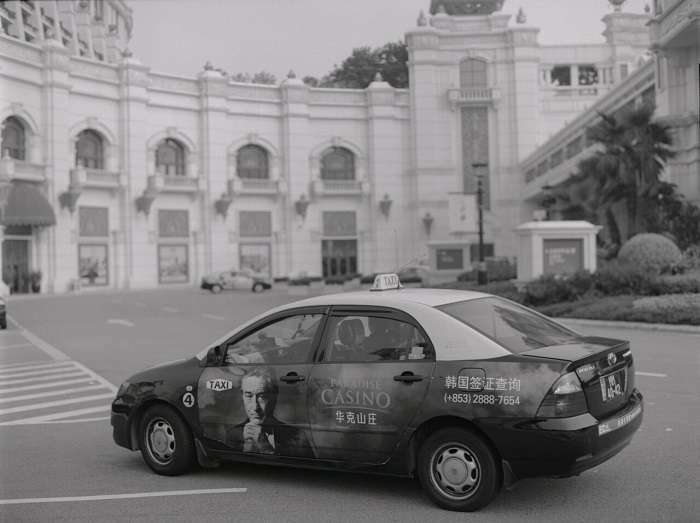 Deniro, Decaprio, and Beckham have all appeared in advertising campaigns for local casinos which show them in formal attire ready to explore the night life of Macao. Similarly, stars from Korea to India come to Macao to walk red carpets at film festivals, concerts, and enjoy Macao as a tourism and lifestyle destination. “Tek sei tou” (踢死兔) is the phonetic version of “tuxedo” in Cantonese. It directly translates as “kick the dead rabbit.” This playful, seemingly nonsensical mnemonic helps Cantonese speakers remember this English word. One might also construe that it has some class based significance, perhaps implying a criticism of the upper class; but I have not encountered any literature or references to directly support this interpretation. In contrast to this speculation about the etymology of the Cantonese phrase, it is clear that tuxedo, in fact is an Algonquian word, as it has its origins in the dinner jackets worn by wealthy New Yorkers visiting the resort town of Tuxedo Park, New York in the later part of the 19th century. This formal evening wear has remained a symbol of affluence. Worn to weddings, film premieres, and state dinners, it has become synonymous with wealth, success, and leisure. More than just a sartorial history, the iconic character of the tuxedo signals the associated affects of aspiration and accomplishment. In New York’s Chinatown, from 1897 to the 1920s, the “Chinese Tuxedo” operated as a popular restaurant; and in 2017 a new restaurant opened with the same name. This genealogy from Tuxedo Park through to Chinatown is slim anecdotal proof of anything; but it does show a legacy of trading on black tie as a persistent marker of success and cosmopolitanism. It is a concept that travels. The forms of luxury and leisure change and evolve like fashion but the desire and aspiration for such forms persists. What does this mean for a city like Macao attempting to brand itself as a place for leisure and luxury? The tuxedo may be more or less relevant depending on the whims of fashion, but the desire to differentiate and create markers of success remain. For most, to wear a tuxedo is a rare occurrence, something just rented for the day, unless it is a part of one’s uniform. Many of the dealers and hospitality staff that populate Macao’s casino resorts wear some variation of the tuxedo or formal evening wear. I know the only time I wore a tuxedo was to my high school prom, so I can not profess to be an expert in the particulars of high-society fashion. I did, however, grow up seeing a certain kind of male cosmopolitan subject decked out in tuxedos. I watched James Bond and countless other espionage themed films portray a world of international travel, danger, and leisure. When I first came to Macao in 2008 to teach film-making at the University of Macau I was uncertain what might be the appropriate attire. I knew very little about Macao; only later did I learn more about the city, about its Portuguese colonial past and its history as a port, one that predated Hong Kong’s later role as the region’s center for trade. I also learned that even though I did not know about Macao directly, I had unwittingly grown up with it. As a child in the 1980s and 90s in the U.S. making the usual pilgrimage to see movies on the weekends, I had unwittingly seen a version of Macao appear on screen. Macao regularly stood in for Shanghai during years when commercial production in the mainland was not possible. It was there, when Indiana Jones in a white tuxedo replete with a red carnation escaped from a bar in the opening of Indiana Jones and the Temple of Doom (1984). And it was there again in the Kung Fu films of the 1970s. Hong Kong based studios like Golden Harvest and the Shaw Brothers used the streets of Macao as a stand in when they were unable to shoot in Shanghai or elsewhere in Mainland China. Perhaps most notably, in Bruce Lee’s Fist of Fury (1972), Macao again played the part of Shanghai. Sean Penn and Madonna’s Shanghai Surprise (1986) also used Macao to stand in for Shanghai. During the shooting, Penn notoriously fled Macao after being arrested for attempted murder of a paparazzi caught in his hotel room (South China Morning Post 2004). This gossip cements the cliché of Macao as a place to which, and from which, one escapes under the cover of night. In the French film Largo Winch (2008), based on the Belgian comic by the same name, Macao plays Brazil; with the village of Coloane dressed up to play the part of the state of Mato Grosso. Locals were easy enough to cast as extras given the Portuguese connection. The James Bond film, Skyfall (2012), also shows an invented Macao, a virtual Macao that was produced by an animation studio in Shanghai. The computer rendered establishing shot shows a fantasy version of the floating Casino Macau Palace that once famously operated in Macao. In the scene, James Bond appears in a dark blue tuxedo, enters the lantern lit casino and narrowly escapes equally computer rendered Komodo dragons and other prototypical bad guys. In Thom Anderson’s video essay Los Angeles Plays Itself (2003), Anderson shows how the city has been seen in films throughout the many years of filmmaking produced along its streets. The changes in the city are revealed in the background of films that never had such a documentary intention. He also highlights ways in which the city itself has played as a character in films. Los Angeles became a good guy and a bad guy, a pivotal part that could be relied on to support one’s plot. Macao has also played itself and continues to play itself in films meant for the burgeoning mainland Chinese market and for international audiences still apparently keen to see James Bond walk into a exotic bar and ask for a drink. Anderson’s approach to Los Angeles as seen through film, echoes the Mnemosyne Atlas of Aby Warburg. Warburg sought to trace and explain the persistence of iconography in Western art. There has been a resurgence of efforts to link Warburg’s visual approach to art history to contemporary theories of the archive and curatorial practices (Latsis 2013). In the Mnemosyne Atlas, Warburg constructed panels with photos of different works of arts on a black background. Whether or not the central iconography of Warburg’s panels are legitimate underlying engines of art history, the form of his approach is still relevant. These black panels grouped artwork from different time periods and cultures, much like Anderson looks to draw links by putting movie scenes from different eras side by side in his film collage in order to draw out the iconography of Los Angeles. Warburg looked for the Pathosformel or “emotionally charged visual tropes” expressed through elements in western art (Becker 2013, 1). He focused on specific details and ornaments what he called bewegtes Beiwerk” or animated accessories.” For Warburg, the flowing hair and dresses in the Birth of Venus and Primavera paintings by Sandro Botticelli and work by Domenico Ghirlandaio hinted at some underlying motion and energy (Russell 2007). In Macao, tuxedos, nightlife and other such images of success and luxury hint at some underlying possibility of financial power and mobility. To see cosmopolitan figures in movies and advertising campaigns is to see the potential of a cosmopolitan subject. The goals of diversifying Macao’s economy and creating more family friendly tourism activities arrive into a visual landscape that is already populated by figures of cosmopolitan subjects from earlier eras. The popularity of Anderson’s video essay and the renewed interest in Warburg may have something to do with the ways in which we are regularly tasked with negotiating a landscape of multiple images, genres, and media content. To see and experience Macao as a city is to negotiate these links, to sift through a wide array of user-generated content, social media feeds, and popular media. Historical images of it and emergent visions of what it may soon become can be thought together at the same time. The origins of a particular Macao modern or urban imaginary may not be so clear but the persistent details and images of success and luxury remain. There may not be a continuous genealogy of luxury that we can trace. We may, however, find parallels in the depictions of a fictional Macao on display in movies from a wide variety of eras and genres. Film noir and precode films from Hollywood and Europe imagined Macao as a place to escape to and from, a liminal port city on the physical edge of China and the discursive edge of morality and legality. The city’s appeal was that it worked as an escape from the rest of the world. These story-lines primarily appealed to western fantasies of travel to exotic locales with heroic male leads saving troubled women from the dangers of a dubious other. In movies and in reality, however, it was a place to hide, a place like Casablanca from which to flee the fronts of World War II. In the nineteen forties it served as a nearby escape from the Japanese occupation of Hong Kong and mainland China. Then governed by a neutral Portugal, Macao was a place to wait out the war. It was also a place to hide and move money into and out of China. This was aided by the fact that it was not a signatory to the international gold standard so it served as a financial intermediary between otherwise warring sides (Gunn 2016). And later it was a refuge for those fleeing from the Cultural Revolution in mainland China. This trend continued in the 1960s and 70s, when numbers of overseas Chinese from Myanmar and Indonesia escaped to Macao. Later on Cambodian and Vietnamese additionally sought out refuge in Macao. The exceptional status of Macao, made it attractive to a wide variety of interests and a perfect location for the gaming industry to grow and eventually eclipse Las Vegas. Image 2. Poster Macao, l’enfer du jeu (Gambling Hell 1942). Demo Films. The earliest western film set in Macao was the French film Macao, l’enfer du jeu (1942) or as it is known by its English title Gambling Hell directed by Jean Delannoy. It was based on a book of the same name by Maurice Dekobra and tells the story of a lounge singer in peril in Macao only to be saved by a ship captain. In Josef von Sternberg’s Macao (1952) another lounge singer, played by Jane Russell also finds herself in danger in Macao only to be saved again by the male lead played by Robert Mitchum. In both of these films, Macao is depicted as a place of peril, an existential milieu that must simply be survived. In Josef von Sternberg’s earlier film Morocco (1930), staring Marlene Dietrich, the character of the endangered lounge singer already appears. In one scene, Dietrich’s character famously appears wearing a tuxedo, replete with white tie and top hat. This scene has since been interpreted as a positive emblem of female empowerment and gender play. Years later, in Macao (1952) Russell’s character does not don a suit but she occupies the same position as a lounge singer surrounded by a backing band as she soundtracks the gaming of the casino’s patrons. Both these films set in Macao were notably not shot in Macao outside of some exterior pickups for the later film. This meant that both literally had to reconstruct Macao on a sound stage in France and Hollywood respectively. These constructed visions of the city offer an imaginary urban space that may never actually be visited but remains visible. Image 3. The Cotai Strip, Macao. Copyright 2018 Author’s own. Since the opening of the casino licenses in 2002, a number of large scale casino-resort complexes have been built in a stretch of reclaimed land between the previously separate islands of Taipa and Coloane. Sheldon Adelson, the owner of the Venetian, branded it the “Cotai Strip” in a clear move to both rival and mimic the Las Vegas Strip. From the Venetian to the City of Dreams, from Studio City to the Galaxy, each resort offers a different themed space combining hotels, retail, and gaming tables. The urban on offer in these themed spaces is a particular kind of enclosed or encapsulated luxury. Promotional material for these venues and the venues themselves present a vision of the city that is regularly swept clean and free as possible from everyday concerns. The mundane and the cosmopolitan are etymologically related, they are both of the world. The distinction is which world. The mundane suggests a world, from which to escape, and the cosmopolitan suggests another world, to which to aspire. By comparing images of a cosmopolitan subject in movies set in and shot in Macao, we can see changes in the world of leisure that is on offer. Through these images we can consider for whom and to what end this vision of a luxury city is created. These contemporary media, when combined with historical images of the city, form an ever evolving picture about what Macao was, is and will be. As Venturi, Brown and Izenour show in Learning from Las Vegas, there is much to be learned from the vernacular architecture and aesthetics that arise in support of and alongside the gaming industry. The compressed confines of Macao and its status as a special administrative region of China, make it the most densely populated region in the world, with 21,340 people per square kilometre (DSEC 2017). At first glance Macau’s casino architecture appears to have little to do with the expanses of highway and roadside signs that these scholars studied in Nevada. The architectures and aesthetics of Macao, nonetheless, address visitors directly as iconic images. Visitors to Macao crowd to take in the ever-present Grand Lisboa, with its pineapple shape and mirrored base. Shuttle buses unload masses of tourists at the internationally themed casino resorts of the Cotai Strip. The buildings themselves serve as giant LED displays delivering images of success and leisure. These themed architectures and spaces are designed to be iconic, to be seen and photographed, to lure in patrons and stand in as a backdrop for photos to be taken back home and shown around to friends and family, first hand proof for having been there. Whatever a visitors’ wins or losses at the gaming tables, this experience of the themed architecture confirms participation in a cosmopolitan space. Image 4. Grand Lisboa Macao. Copyright 2018 Author’s own. The video content on the giant LED billboards on display inside the shopping arcades of the casino resorts also narrate an experience of the city that focuses on escape, luxury, and new aesthetic experiences. Tuxedoed celebrities, brand ambassadors, and movie stars stand in as proxy representatives of what it is like to visit a world of luxury and success. The reality of travel is, of course, not always as glamorous as that being portrayed in films and promotional videos. Masses of tourists must negotiate lines at the border and lines at the shuttle buses. Public transportation and the streets themselves can become overwhelmed with the sheer numbers of visitors. This can lead to tension between locals and tourists. Similarly construction projects to improve the existing infrastructure have become symbols of the difference between the needs of a tourist only in town for a day or two and a local resident troubled by the additional traffic and delays in construction. Such a gap between promotional images used to market a city to tourists and the reality of mass market tourism is not, of course, unique to Macao. What is specific is the relationship between the scale of the mass market tourism and the recurrent images of high-rolling vip gaming. The foil to the commonly portrayed urbane subject jetting into Macao for a round of VIP gaming, is the figure of the nouveau riche or in Cantonese touhou (土豪). This term suggests provincial Chinese who have come into new money without an associated cultural background or frame of reference for the luxury items that they now have the economic power to purchase. As in the familiar shift in Western popular culture from the flâneur to the dandy to the swell, the image of a wealthy mainland Chinese visitor to Macao runs a continuum from a positive vision of a modern cosmopolitanism to that of a naive person from the countryside. Hong Kong director Wong Jing’s series of gaming themed films, starting with God of Gamblers (1989) show Andy Lau as a debonair, suave gambler who is able to win high stakes games involving international rivals. These films, while less commonly the subject of film studies criticism, do express popular anxieties and attitudes of film audiences that have had to negotiate the changing political landscape of Hong Kong (Chan 2011). In the most recent film from the series, From Vegas to Macau III (2016), Lau remains a worldly character even able to best K-Pop star Psy who makes a cameo in the film. This figure of the cunning and witty gambler contrasts with mainland produced films that have focused on using Macao as a setting for romantic travel genre films. In director Xue Xiaolu’s Finding Mr. Right II (2016) a casino worker who is the daughter of a gambler who moved to Macao from mainland China, finds love through becoming anonymous pen-pals with a similarly second generation Chinese realtor living in Los Angeles. In the end, they find love not in success at the gaming table, but rather in a bookshop in London. These two films, both catering to the large mainland Chinese audience, provide a chance to see how Macao has evolved as a constructed cinematic space. A vision of the city is built in much the same way that scale models are used in architectural previsualization to present what will be. In other words, these new visions of Macao speak to an imagined future. Image 5. Grand Lisboa Macao. Copyright 2018 Author’s own. Macao is simultaneously different worlds. It is sometimes a cosmopolitan world of luxury. At other times it is a mundane world of 24 hour shift work and labor in support of the large scale of mass market tourism. The intent of this article has been to consider if the image of the cosmopolitan can be used to make sense of these different worlds. By focusing on the details that represent success in films set in Macao, can one contribute to the existing literature on cosmopolitanism? Questions about the relationship between globalization, tourism, and cosmpolitanism, as explored in work by Ulf Hannerz, James Clifford, Aihwa Ong and others, can also be brought to bear in Macao. While scholars might debate the utility of the cosmopolitan as a concept in theorizing global mobility, it is clear that the cosmopolitanism on display in films set in Macao is a kind of costume that is tailored and worn for different audiences and purposes. Particular forms like the tuxedo give shape to the otherwise fleeting affects of aspiration, ecstasy, and interest. Like the animated accessories Warburg noted in Renaissance painting, the forms of fashion indicate that there are some otherwise unseen forces at play. At different times, these cinematic details may be more or less significant, represent different symbolic or cultural capital, but their presence is a sure sign that there is something at stake. The cosmopolitan subject on display in Macao, and in films about Macao, is an urbane subject whose very being is connected to and of the city. The tuxedo provides the corporeal form for this subjectivity, and promises that there is somewhere to go, some party, event or other special occasion that necessitates such formal evening wear. So the brand ambassadors, movie stars, and other such besuited subjects confirm that there is something happening. There is a place to which we may or may not be invited, rarefied exclusive spaces to which Macao offers access or, at least, of which it offers glimpses. The theme spaces of each mega-resort casino complex offer visions of the city. The city is confirmed in the faux facades that line the outside of the Venetian and the avenues and shopping arcades of its interior. The existence of these cities in miniature is also confirmed in the details of luxury that serve as a guarantee that there are still more exclusive VIP spaces that may not be seen but whose existence is confirmation of the scale of the city. The tuxedoed subject is proof that there is still more to see and experience just out of sight. In this way, depictions of a cosmopolitan subject help build the city as a new world to be discovered. Themed spaces and built environments are not the sole domain of Macao. The window shops of turn of the century Paris juxtaposed luxury goods and products sourced from around the world long before the Cotai Strip. Through a simple stroll one could take in the world, browse what it had to offer. To walk in the enclosed canal promenade of the Venetian Macao with its painted sky ceiling and swimming pool blue canal water is to similarly experience a commercial world of products. The relevant question here may be if this version of the Venetian is doing something different than the one that came before it in Las Vegas. Is this copy of a copy producing something new? So too the newly unveiled half scale version of the Eiffel Tower at the Parisian Macao is not the first to try and trade on this vision of modernity and European cosmopolitanism. As casino companies look to new markets from Japan to the Philippines, Macao’s unique advantage as a nearby region to China where gaming is permitted is drawn into question. Promotional videos and marketing teams from these new projects are also after the same VIP gambler and Chinese tourist. So Macao must regularly offer up new visions of luxury and new urban experiences to compete for their attention and interest. In K-Pop star PSY‘s shoot for his 2017 music video “New face,” shot in the resorts of the Cotai Strip, he plays a variety of parts, from the bellhop to the masseuse to the cosmopolitan tourist. PSY wears the attire appropriate to each, from the staff uniform to the tuxedo. His ecstatic enthusiasm for the potential of “new face,” new people and new affects suggests exactly the kind of appeal that the local gaming companies want to attract. This music video, with its tightly choreographed dance numbers set in and around the city, greets visitors on the Turbojet ferries that shuttle tourists to and from Hong Kong and Macao. It plays together in a loop alongside promotional videos from the casinos and Macao tourism office. The combined effect is designed to promote Macao as a place of visual pleasures and leisure. However they are dressed, the tourist, pop star and the movie hero alike want to imagine themselves as cosmopolitan, part of a world that includes them and is full of new possibilities. Video 1. PSY’s music video New Face. For those studying cosmopolitanism, tourism and urban studies, we might ask if the comparative visual approaches of Warburg and Anderson, not to mention PSY, offer a relevant method to better understand how the urban imaginary that precedes a visitor’s arrival to a city inform their experience of it? Does such imagery do more than simply create interest? In the specific case of Macao, cinematic images and details of nightlife persist as traces of an earlier era of colonialism and gaming. New mass market tourists may never dress up in these fashions, but they are still met with these images. They are seen ahead of time, on arrival, and in memories shared after the trip. They appear in advertisements, films, and even in the background of their own tourist photos. The changing symbolic implications of luxury and black tie attire across various contexts are up for debate but the persistence of these images is undeniable. Brands and companies trade in these details while the government-organized Parade through Latin city does not. They are two different approaches to the multicultural and cosmopolitan. Both revolve around the optics of seeing the world, experiencing it as a different set of affects and aesthetic pleasures. The government’s aim to promote Macao as a family friendly destination and to diversify the economy away from its reliance on the gaming industry compete with the legacy of the cosmopolitan subject that has historically been a predominant figure in narratives and films about Macao. At face value, many of the films set in Macao are comprised of the same film tropes and clichés that inform many other genre movies. From action adventure chase scenes, troubled femme fatales, and scenes of high stakes gambling, the actions of these films appear to have little to do with the current industry of mass market tourism. 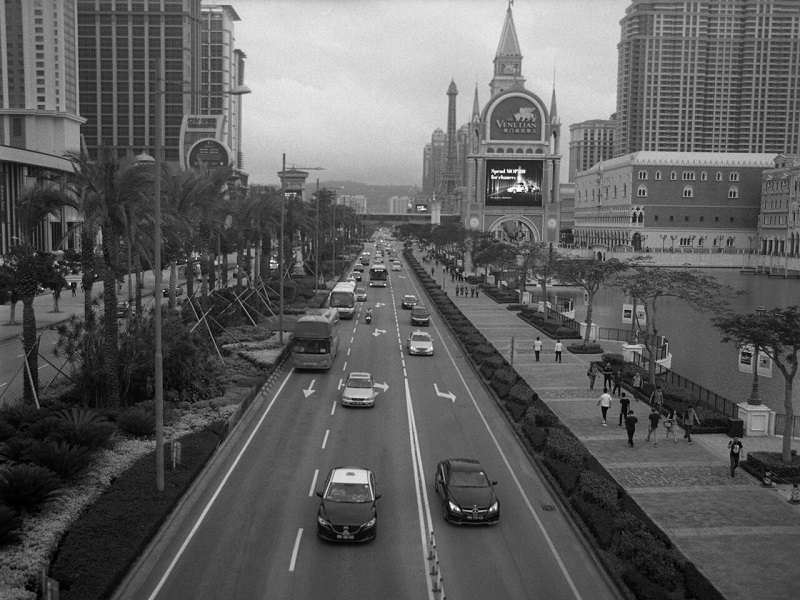 The clean, safe urbanism and interior spaces of the Cotai Strip with its all-encompassing mega resorts appears counter to the allusions to criminality and noir that informed earlier representations of Macao in film. What they have in common is the offer of an encounter with another world of new and different experiences. When transitioning from one casino to the next, from the Venetian to the Parisian, from the Galaxy to the City of Dreams, these border crossings between different themed spaces and cities in miniature are a positive advantage of Macao. The difference on offer is important. Macao’s cultural and urban heritage is just one other city in miniature offered to be seen and experienced. If we accept that these casino resorts are miniature cities or even worlds, we might describe the movement between them as a kind of encapsulated cosmopolitan. They provide a safe form of travel across different spaces without the dangers or anxieties that accompany so many border crossings. The question to be posed, then, is whether the amenities, services, and experiences they provide to tourists looking to temporarily participate in new cultures and cities constitute a new form of cosmopolitanism. To answer this question of whether or not a new form of cosmopolitanism is on display in Macao involves deciding where to look for the answer. In addition to the built environments of the Cotai Strip and the earlier fantastical casino architecture of Macao, one can also find the image of the city in visual culture. This entails not just images from movies and advertisements but also the self-generated content produced by the tourists and residents of a city. Like Warburg and Anderson, so many of us now regularly make archives and share collections of images online. On social media and in the consumption of visual culture, we curate our desires and interests. The resulting collections made up of material from different influences and cultural traditions draw into question the utility or necessity of the cosmopolitan as a particularly distinct or rarefied figure or subject. In other words, browsing and collecting worldly images and experiences is no longer just the domain of international spys and well financed scholars. Nonetheless, there is still a need to name this aspiration that drives tourists and flâneurs alike to take in differences between worlds and chronicle the encounter. Casino designers, filmmakers, and content creators design new worlds of images to be seen and visited. In the case of Macao, the visions they offer trade in certain recurrent icons of success and leisure, tuxedos and other markers of achievement. In order to make sense of these new visions of cosmopolitanism and success I suggest that it is helpful to put them alongside the images that preceded them, to construct a local, miniature Mnemosyne Atlas; or in the case of Macao, to think “kick the dead rabbit” alongside “Macao, l’enfer du jeu” and the all the films and visions of Macao still to come. Los Angeles plays itself. Directed and written by Thom Anderson, starring Encke King, Ben Alexander, Jim Backus. Los Angeles: Submarine Entertainment, 2003. 169 min. Macao, l’enfer du jeu. 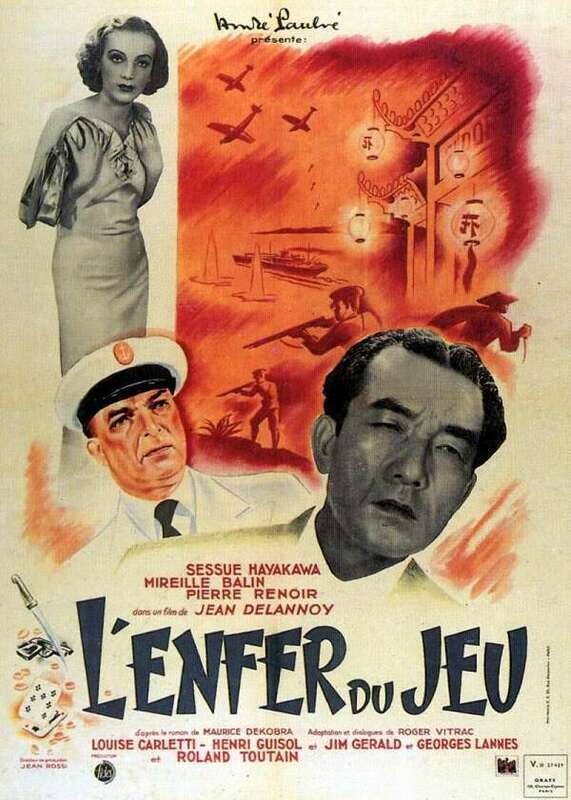 Directed by Jean Delannoy, written by Maurice Dekobra (novel), Pierre-Gilles Veber, Roger Vitrac, starring Sessue Hayakawa, Mireille Balin, Henri Guisol. Demo Films, 1942. 90 min. Indiana Jones and the Temple of Doom. Directed by Steven Spielberg, written by Willard Huyck, Gloria Katz and George Lucas, starring Harrison Ford, Kate Capshaw, Jonathan Ke Quan. Los Angeles: Paramount Pictures, 1984. 118 min. Shanghai Surprise. Directed by Jim Goddard, written by John Kohn and Robert Bentley, starring Sean Penn, Madonna, Paul Freeman. Los Angeles: MGM, 1986. 97 min. Macao. Directed by Josef von Sternberg and Nicholas Ray, written by Bernard C. Shoenfeld and Stanley Rubin, starring Robert Mitchum, Jane Russel, William Bendix. Los Angeles: RKO Pictures, 1952. 81 min. Fist of Fury (Jing wu men). Directed and written by Wei Lo, starring Bruce Lee, Nora Miao, James Tien. Hong Kong: Golden Harvest, 1972. 106 min. God of Gamblers (Dou san). Directedand written by Jing Wong, starring Yun-Fat Chow, Andy Lau, Joey Wang. Hong Kong: Win’s Movie Productions Ltd, 1989. 126 min. From Vegas to Macau III (Du cheng feng yun III). Directed by Andrew Lau and Jing Wong, written by Jing Wong, starring Sally Victoria Benson, Chun-Tung Chan, Jacky Cheung. Hong Kong: Gala Film Distribution Intercontinental Film Distributors, 2016. 113 min. Finding Mr. Right 2 (Beijing yu shang: Xiyatu 2). Directed by Xue Xiaolu, written by Miao Jiao and Xue Xiaolu, starring Wei Tang, Xiubo Wu, Zhihong Liu. Beijing: EDKO Distribution, 2016. 132 min. officialpsy. “PSY – ‘New Face’ M/V”. Filmed [May 2017]. YouTube video, 3:21. Posted [May 2017] https://www.youtube.com/watch?v=OwJPPaEyqhI. DESC (The Statistics and Census Service) (2017, May 5) “Detailed Results of 2016 Population By-Census” http://www.dsec.gov.mo/Statistic/Demographic/GlobalResultsOfBy-Census/2016%E4%B8%AD%E6%9C%9F%E4%BA%BA%E5%8F%A3%E7%B5%B1%E8%A8%88.aspx?lang=en-US. South China Morning Post, December 26, 2004. “Penn tells of Macau arrest for murder attempt” scmp.com http://www.scmp.com/article/483396/penn-tells-macau-arrest-murder-attempt. Chan, Brenda. 2011. “Identity and politics in Hong Kong gambling films of the 1990s: God of Gamblers III and God of Gambler’s Return” in New Cinemas: Journal of Contemporary Film, 9 (1):35–48. Becker, Colleen (2013). “Aby Warburg’s Pathosformel as methodological paradigm” in Aby Warburg’s Pathosformel as methodological paradigm” in Journal of Art Historiography (9). Clayton, Cathryn H. 2010. 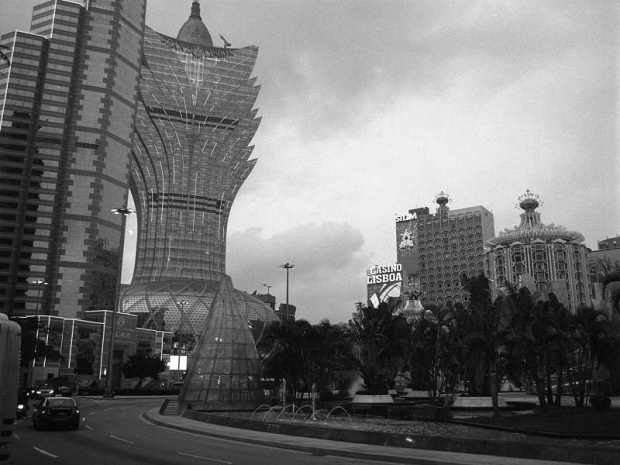 Sovereignty at the edge: Macau and the question of Chineseness. Cambridge: Harvard University Press. Clifford, James. 1997. Routes: Travel and Translation In the Late Twentieth Century. Cambridge, MA: Harvard University Press. Gunn, Geoffrey C. 2016. Wartime Macau: Under the Japanese Shadow. Hong Kong: Hong Kong University Press. Hannerz, Ulf. 1990. “Cosmopolitans and Locals in World Culture” in “Theory, Culture & Society 7(2): 237–251. Latsis, Dimitrios S. 2013. “Geneaology of the Image in Histoire(s) du Cinéma: Godard, Warburg and the Iconology of the Interstice” in Third Text, 27(6): 774–785. Ong, Ahiwa. 1999. Flexible Citizenship: The Cultural Logics of Transnationality. Durham NC: Duke University Press. Russell, Mark A. 2007. Between Tradition and Modernity: Aby Warburg and the Public Purposes of Art in Hamburg 1896–1918. New York: Berghahn Books. Simpson, Timothy. 2011. “Macao Noir: Criminal Brotherhoods, Casino Capitalism, and the Case of the Post-Socialist Chinese Consumer,” Fast Capitalism 8(1). Special issue on Global Noir,” ed. By Gray Kochharr-Lindgren (With photographs by Adam Lampton). Simpson, Timothy. 2014. 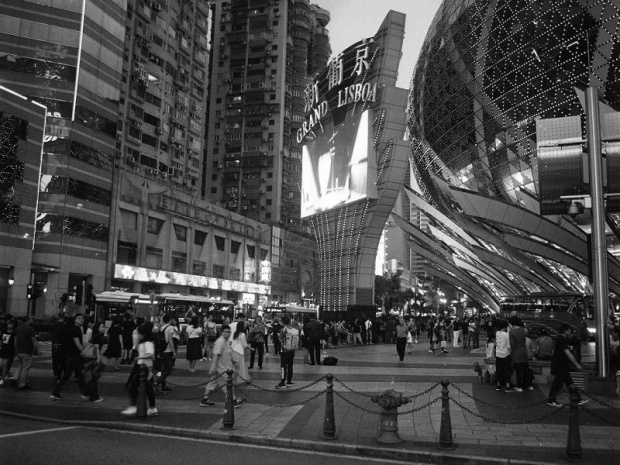 “Macau Metropolis and Mental Life: Interior Urbanism and the Chinese Imaginary”, International Journal of Urban and Regional Research 38(3): 823–842. Venturi, Robert, Denise Scott Brown, and Steven Izenour. 1977. Learning from Las Vegas: the forgotten symbolism of architectural form. Cambridge, Mass: MIT Press.